Based on the selkie myths, this is a wonderfully original debut novel. An extraordinary tale with dark undercurrents, it’s about the power of love, magic, forgiveness and conversely violence, loss and atonement. It explores the meaning of community, the story giving the impression of being set in times gone by, which combined with the complexities of living in a small fishing village, intensifies the atmosphere. When life could be extremely harsh, villagers didn’t stray far from home and weather and sea dictated their way of life. Donald Macfarlane has been bullied and teased for most of his life and, as a result, has grown up self-conscious and introverted. An incapacitating skin condition doesn’t help and makes fishing difficult. He keeps himself isolated from the rest of the small fishing village where he lives a lonely life with his mother, Bridie. Out one night, seeing to the crab pots, Donald witnesses something spectacular and his impulsive and forceful reactions have far reaching consequences for himself and everyone around him. He has to live with the repercussions of his actions even as he tries to atone for his wrongdoing. And although the initial fault lies with Donald, it was compounded by his mother’s intervention. The story is, at heart, the retelling of a selkie legend brought to life with a diverse and complex cast of characters amid the wild and rugged backdrop of a rural Scottish landscape. There was not a whisper of wind tonight, and no sound from the sea at all. As he walked along the strand to where his rowboat was drawn up, the waves were lapping at his boots, just stroking the shoreline, hushing it like a woman soothing her child. The boat was silvered all over with tiny frost-flowers, sparkling in the moonlight. Donald paused, unwilling to lay hands on it, to spoil its perfection, to mar the utter stillness of the night by dragging it over the shingle and rowing out from the shore. Almost, at times like this, he could love the sea. But there were jobs that had to be done, and the tide was turning. He bent to the task. The setting is described wonderfully, with evocative and vivid imagery, beautiful prose and in depth characterisations. So much so that I was there, witnessing the story unfolding. The perception and understanding of human nature seems very intuitive. Donald especially, grows and changes beyond recognition. From an insular and ineffectual youth who does something terrible in a moment of madness, to someone who learns the true meaning of love, understanding others and the torment of loss. His personal development is due entirely to Mairhi and he loves her completely. Very much a character driven tale with Mairhi, Donald and Bridie at the forefront, although the rest of the cast have an important part to play. Mairhi is an enchanting character, delicate, other worldly and fully innocent. She is initially much mistrusted as an incomer by the village residents who are hardy, down to earth souls. They begin to realise she has a special, magical quality which benefits the community, although not everyone understands or makes her unconditionally welcome, even as their lives are transformed. Bridie is the stalwart member of the family, but her decision to play a part in controlling Mairhi’s fate won’t let her rest and she becomes tormented by remorse. Despite beginning with an act of violence (according to legend if a selkie’s skin is taken and hidden from her, she is in the man’s power and forced to become his wife) this is a beautiful, captivating and haunting book which was an (emotional) pleasure to listen to. Su Bristow’s writing is superb and captured my imagination from the start. It’s a book I won’t forget in a hurry. Angus King has a lovely Scottish lilt which was perfect for the narration. He did a brilliant job, I’ll be looking out for more of his work. Su Bristow is a consultant medical herbalist by day. She’s the author of two books on herbal medicine: The Herbal Medicine Chest and The Herb Handbook; and two on relationship skills: The Courage to Love and Falling in Love, Staying in Love, co-written with psychotherapist, Malcolm Stern. Her published fiction includes ‘Troll Steps’ (in the anthology, Barcelona to Bihar), and ‘Changes’ which came second in the 2010 Creative Writing Matters flash fiction competition. 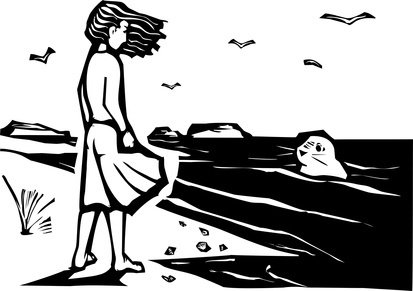 Sealskin is set in the Hebrides, and it’s a reworking of the Scottish and Nordic legend of the selkies, or seals who can turn into people. It won the Exeter Novel Prize 2013. Her writing has been described as ‘magical realism; Angela Carter meets Eowyn Ivey’. Lovely review of a lovely book. That act of violence you mention was integrated so well into the story I thought. Thank you 🙂 Yes, I agree, it was. Lovely review! I really must make time to read this book soon as it sounds stunning. I already have my copy, this beautiful review has given me a nudge to move it up a bit on my list. Thanks. This looks so good. I love mythology and have rarely seen a retelling of the Selkie legend. Thanks for the recommendation. 🙂 Going on my TBR list. Oh good 🙂 I hope you enjoy it as much as I did.